Already purchased? Please sign in to view. Functional cognition describes the ability to participate in everyday activities, combining the constructs of function and cognition. Substantial literature now exists to support assessment and intervention methods for functional cognitive deficits, and policymakers are increasingly requiring improved methods to track functional cognition and address it across health changes. 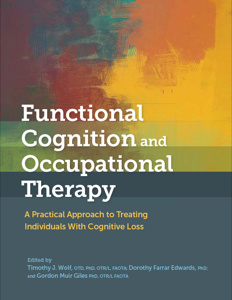 This is the first comprehensive text to focus on methods to assess and develop interventions for people with functional cognition impairments. Extensive videos, practical how-to information, theoretical bases, OTPF alignment, and current evidence guide students and clinicians in integrating the assessment information into the context of clinical care. Readers can immediately apply what they learn to those with whom they work. Do you need to re-use or reproduce this work? Please log in to view your account information. Don't have any account? You can register for one now.